Trip to London Olympic run up | S J M W E L L - Fashion, Beauty & Lifestyle blog. The other day we made a little trip to London town, London is my favourite place! Being only 4 day's until the Olympic's starting the tube was surprisingly empty, out of all area's the Tower of London was so busy, only when we got home we saw that there was a Taxi driver protest & someone actually jumped off the bridge?! Friday was storm's and then Monday hot hot hot sun, I actually burnt *sadface* and crazy me wore tight's and boot's. Also had a lush time in Covent Garden's high-fiving the guy on the street who dressed in gold in the photo up there and browsing round, buying Lush goodies, popping in the beautiful Laduree shop to buy some Macaroon's, going in American Apparel for the 1st time ever and seeing the Pixiwoo sister's. I want to go back already and shop in some market's! 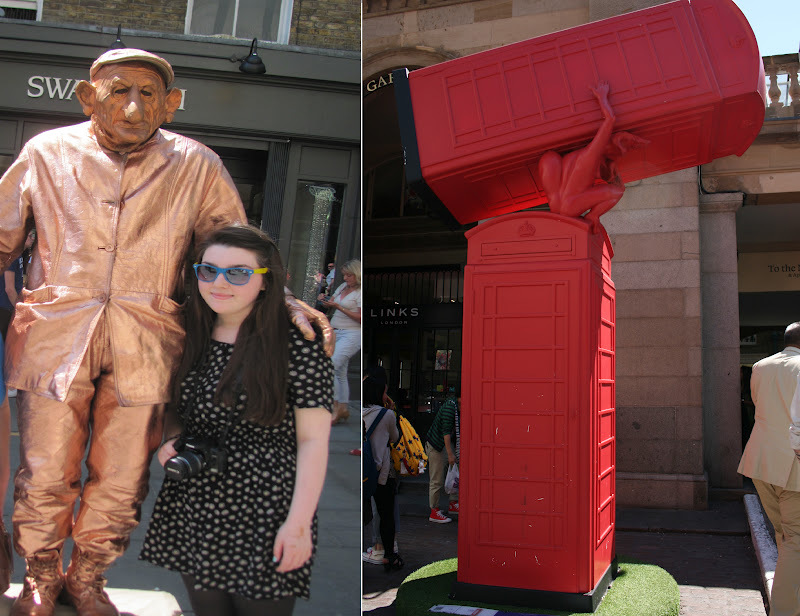 Looks like you had a great time, I love people watching around Convent Garden and heading down Oxford Street! I know, especially the underground! Luckily I get free travel & Priv's for the u.g as my fam work's on the Railway, wouldn't use/pay it as often as I do if I didn't have it though! Looks like you had a fab time! :) Think I must have been there the same day as you - the weather was gorgeous wasn't it? !